The massive consolidation of physician practices, hospitals and health systems coupled with the transformative changes stemming from Obamacare and the HITECH Act has left medical professionals with a lot of questions. They vary from best practices for rolling out ICD-10 to pros and cons of Bring Your Own Device. A new social network to connect staff inside and outside their health systems wants to help them collaborate on health IT and other issues these groups face. The launch of Next Wave Connect has come less than a month after Next Wave Health initiated the cloud-based infrastructure to support it. The head of Next Wave Connect, Drex DeFord, has served as the CIO of Seattle Children’s Hospital and as a chief technology officer in the Air Force Health System. Read more from Stephanie Baum in MedCity News here. When IBM (NYSE: IBM) conducted its study of 1709 CEOs around the world, they found only 16% of them participating in social media. But their analysis shows that the percentage will likely grow to 57% within 5 years. Nearly every respondent in the 1st Annual HIMSS Mobile Technology Survey, which was released Monday, reports that clinicians at their organization have accessed information through a mobile device. Only 38 percent of the respondents, however, say they have a policy in place that regulates the use of mobile devices and outlines a mobile strategy. Can mobile apps boost patient satisfaction? Hospital CIOs need to be careful about the apps they're creating, FDA experts warn. Brad Thompson, an FDA attorney with EpsteinBeckerGreen in Washington, D.C., was emphatic in comments at the World Congress Leadership Summit on mHealth in Boston this morning: Healthcare providers who create health apps can be considered mobile medical app manufacturers just like software firms, development companies and other firms, under the new FDA guidance released last week. Just as popular consumer web apps eventually find their way into the enterprise, the health sector is increasingly taking its cue from the world of web apps. The Seattle product design firm Artefact, whose future camera concept caught the attention of our readers in April, recently designed a prototype patient care app for the Seattle Children's Patient Information System. 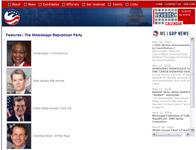 The Mississippi Republican Party's official website has a new addition. "Features" is a new series of video interviews available on the website that gives Mississippians an opportunity to get to know important figures across the state. As of now, visitors to the GOP's website can see interviews with Tchula Mayor Yvonne Brown, State Senator Billy Hewes, United States Senator Trent Lott and Columbus Mayor Jeffrey Rupp. Click here to watch the interviews. Chief executives hear a lot of chatter about new technologies that are going to change the world. Most of them, of course, don’t. So the CEO’s job is to cast a wary eye on new technologies until a few winners emerge that can be commercially harvested. The trick is putting all those new technologies in the context of real industry and market forces. As readers contemplate the year 2006, we at Chief Executive sought to identify three long-term technology trends that really will matter. Some touted technologies like blogs will be important, but not for the reasons many assume. Some hyped ones like radio frequency identification (RFID) will be black holes for money and attention. Still others like supply chain simulation can transform a company’s operations. But all require CEOs to grasp the essential changes in the business landscape. For the full story from Chief Executive, click here. Wikis, Weblogs and RSS: What Does the New Internet Mean for Business? The Verizon Foundation recently launched an online resource center to help not for profit companies use technology.